the knitting of the edging has much improved. after a few repeats, i think i loosened up a bit, so the p2togtbl’s aren’t quite so difficult. i’m speeding along now (relatively speaking) and am almost halfway through the edging. 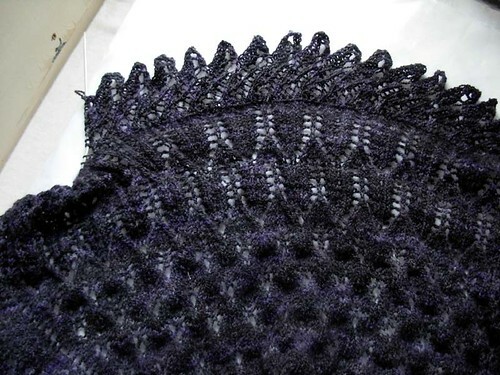 since the edging is knit on, i can begin to spread the shawl out without taking it off the needles, so it’s much easier to see than it has been. Oh no! Resist working weekends! Irtfa’a is looking lovely, and I’m glad the p2togtbl’s are giving you less trouble…there are a lot of them! Irtfa is look absolutely stunning!